One of 12 national trails, the Norfolk Coast Path follows the North Norfolk coastline between Hunstanton and Sheringham. Connected to the Peddars Way at Holme-next-the-Sea both National Trails are usually considered as one. Total route distance is 150 km. The Norfolk Coast Path closely follows the coastline between Hunstanton and Sheringham. The route of this National Trail lies entirely within the Norfolk Coast Area of Outstanding Natural Beauty (AONB). The Norfolk Coast Path connects with the Peddars Way at Holme-next-the-Sea and both National Trails are often considered as one. The most westerly point of the Norfolk Coast Path is the late-Victorian seaside town of Hunstanton. From here it heads almost due east along the coast passing through some area of very special interest with abundant wildlife. The salt marshes near Brancaster are the first of these features closely followed by the Holkham National Nature Reserve with its extensive sandy beaches. Beyond Wells-next-the-Sea the path again encounters some salt marshes passing Blakeney Point with its Grey and Common Seals. 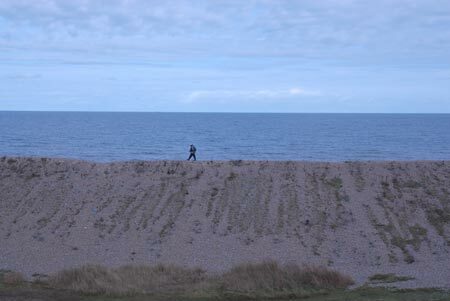 Cley-next-the-Sea marks the start of the section that follows an extensive shingle beach. This continues almost as far as Sheringham where sandy cliffs are protected by concrete walls. As might be expected the path remains close to sea level and so there are few sections where high levels of exertion are required. Access for disabled is good in places although it must be remembered that the path is not usually surfaced. It is worth noting that there is an excellent bus service operating along the A149 coast road between Sheringham and Kings Lynn. Operated by Norfolk County Council, this "Coast Hopper" service is useful for many walks as the bus route shadows the Norfolk Coast Path. This enables one way walks to be undertaken with relative ease but also means that other walks can be altered to suit your needs.